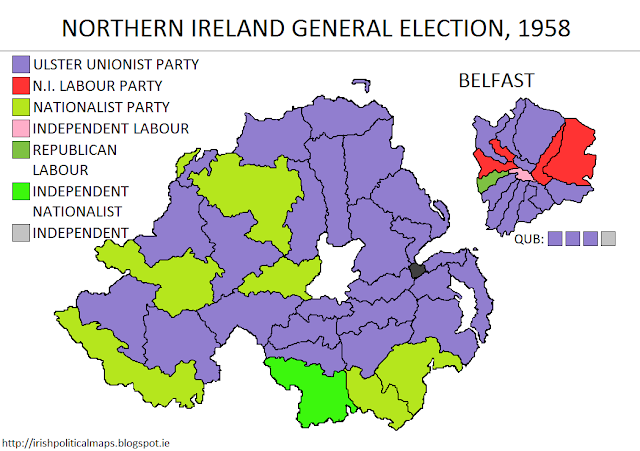 The Nationalist Party had never performed very well in Stormont general elections due to the unique ordering of constituency boundaries, but the 1958 general election represented a particularly low ebb for the party. Although the Anti-Partition League, which had taken two Nationalist seats five years ago, had since disbanded, the party was unable to make any gains in this election and saw Mid Tyrone, a previously Nationalist stronghold, go to the UUP instead. The problems in Northern Irish society bred by the hostility between nationalists and unionists were soon to develop into a very serious situation. This election meant that the Nationalist Party held just 7 seats out of 52. This number was quickly increased upon however when the independent nationalist MP elected for Armagh South, Edward George Richardson, joined the Nationalist Party upon taking his seat. Republican Labour held their seat in Belfast Falls, as did Independent Labour in Central. The Northern Ireland Labour Party made a comeback in this election. After experiencing a huge drop in support amongst Catholics as a result of voting in favour of the union with Britain, the NILP slowly built up unionist support, which paid off in this election with four seats won in Belfast. A new party contested one of the four Queen's University seats: the Northern Ireland Liberal Party, also unionist, would be successful in the next election.